The previous post I wrote featured Etta Baker. It was derived by some rather mocking and playful remarks made TheBluesBloggersWife or for short TBBW. She felt I was totally overlooking some of the more influential women that played the blues. She was right! She would earn the respect of record buying fans and the praise of all the blues artists that she worked with throughout her long successful career; a profession which spanned over four decades. Memphis Minnie was born Elizabeth Douglas on June 3, 1897, in Algiers Louisiana and was the oldest of 13 brothers and sisters. Like most things in that era, music was also homemade. In 1907 a blues musician would play in all kinds of places like house parties, barrel houses, work camps, and traveling shows. Influenced by the local string players that performed at these parties, Minnie would obtain her first guitar at 11 years old. Minnie was more than a good woman blues artist she could hold her own against any of the blues artists of her time. Most importantly she has enthused many of today’s aspiring guitarists. In order to be heard above the crowds, Minnie was quick to embrace the latest technologies. She was one of the first blues players to use a National Guitar. In later years guitarists had amplification to help them be heard, but in those days the National guitar was three to five times as loud as any made of wood. This was because the guitar was made of metal, which is what makes it instantly recognizable. Starting in 1929, Minnie’s recordings exemplify her life, as she moved from the rural South to metropolitan Chicago. After the stock market crash, record companies began to seek out rural guitar based music. 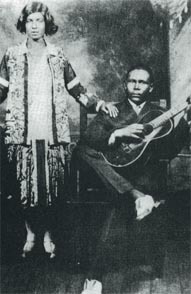 Regardless of what was either more cost-effective or what they were promoting at the time, Memphis Minnie made her professional recording debut in 1929. Minnie and her second husband Joe based themselves in Chicago throughout the early thirties; recording both together and separately. Their marriage and melodic affiliation eventually ended in the mid-thirties. Coincidentally around the time Minnie became increasingly more accepted as a guitarist, vocalist and songwriter. In 1939 she married Ernest “Little Son Joe” Lawlars, and he would be her partner for the next 23 years. In the mid fifties music was changing with the fabrication of rock and roll. Major record labels were beginning to pull out of the blues market. Memphis Minnie’s voice is of an artist who never put up with exploitation, and managed to find happiness while living through tough times. In 1957 Minnie returned to Memphis and retired from the music business. She moved into a nursing home where she lived until her death on August 6th, 1973 at the age of 76. For TBBW’s sake I left out the part why Minnie returned to Memphis in 1957. You can research that one for yourself. It certainly wasn’t tragic. However, I decided I would keep this post upbeat. One thing is for sure, Memphis Minnie certainly lived a wonderfully creative lifestyle without letting the idiosyncrasies of the music business affect her. It sure was an enjoyable experience reading about her life … Have you listened to Memphis Minnie before? Did you know that Led Zeppelin did a cover of one of her tunes called “When The Levee Breaks” in 1971 on their 4th album? Can you name some other artists that were influenced by her? Please remember to add your comments below. Minnie was one of the most Liberated Women in Her Time . On Top of that She was A Black Liberated Woman. Dan thanks so much for commenting here … What a fantastic playlist! … Anybody who reads this should check the above link out! I am getting a heck of an education visiting your blog. I never heard of Memphis Minnie, but she was awesome. We always hear about Bessie Smith, Ma Rainey, and the more popular performers of that era. A woman with an ax, now that’s news. Thanks for sharing this post. You’re very welcome. I’m glad your enjoying the blog. 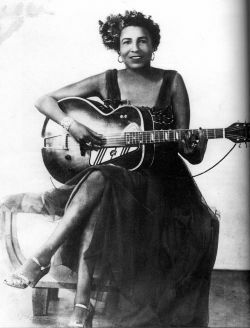 Hi there – great synopsis of Memphis Minnie. Okay, WHAT happened in 1957 when she returned to Memphis? As for musicians who were influenced by her, didn’t Muddy Waters write and record “Honey Bee” (one of his breakout early hits) as his take on Minnie’s “Bumble Bee”…..? I have my own information gathering project called Wild Women of Song: Great Gal Composers of the Jazz Era (www.widlwomenofsong.com) and am starting to collect info about Minnie – whom I’ve always loved. Check out my you tube videos: http://www.youtube.com/wildwomenofsong!